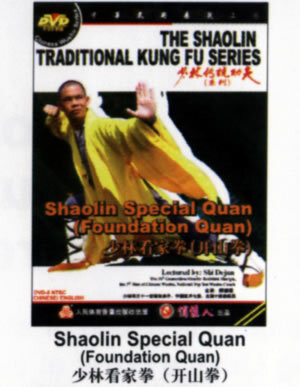 Shaolin special quan is an essential routine, originated to prevent the monk of the temple who didn't learn the skill well and disgraced the Shaolin's prestige after they exited the temple by the Buddhist monk Fu Ju at Song Dynasty. He called together the proficient kung fu monks in the temple to study and abstract the essential skills of the Shaolin Wushu, and taught it to 26 Wushu monks, then set 13 toll-gates with each toll-gates guarded by two Wushu monks, and stipulated that any monk or common disciple who wanted to go out from the mountain must beat the monks who guarded the toll-gates at first, otherwise, he must accept the punishment of joss sticks kneeling and make more efforts to learn skills. These postures which were used for guarding the toll-gate gradually formed Taolu---The Shaolin Thirteen-routine Special Quan. The characteristic of this boxing is: simple movement, agile change, strict posture, quick footwork, and steady frame. This product was added to our catalog on Monday 23 March, 2009.